Dog begging usually begins innocently enough. Your dog gets a whiff of food you're making something for yourself or hears you puttering around the kitchen and suddenly shows up expecting a tasty reward. If his presence isn't enough to get his message across he may begin employing a whole range of behaviors designed to make you give in such as whining, pacing, or giving you the dreaded, wide "puppy dog eyes" that almost no one can resist. While giving your dog an occasional bite of human food isn't necessarily dangerous, begging isn't a behavior that should be encouraged. For one, it can make your mealtime extremely irritating. For another, the more your dog is able to get away with this undesirable behavior, the more it could lead to even worse behavior. So it's better to get ahead of the problem before it gets out of hand. They sure are cute and it's hard to not give in when your dog begs for food. So what exactly can you do to prevent or deter dog begging? Rectifying the situation is easier if you start when your dog is a puppy, before he's had a chance to develop bad habits. But it is also possible to put a halt to an already existing begging problem. The key is to establish the proper boundaries where food is concerned. In other words, your dog needs to learn that your food is not his property. This begins by not giving in to him, no matter how insistent his begging becomes. The moment you do give in, you have taught him that anything on your plate is available to him provided he begs enough. This also stands true even if you aren't sitting and eating off a plate. If you happen to be standing at the counter and toss your dog a bite of your snack, he'll become used to that response and expect it every time he sees you with food in your hand. In order to stop dog begging you need to stick to an established routine. Before you sit down to eat or go to the kitchen to get food, try distracting him with a puzzle toy that requires him to work to get food or a treat out of it. 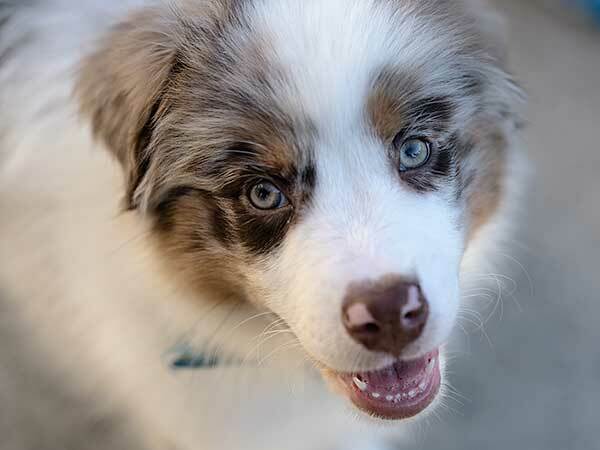 This can be particularly effective with energetic, intelligent breeds like the Australian Shepherd that are too clever to be put off by simpler methods of distraction. It should allow you time to eat in peace and help to break the automatic assumption that your food is his reward. 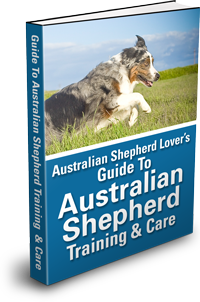 Our official ebook Guide To Australian Shepherd Training & Care should be in every Aussie owner's digital library. You could also try using a simple "stay" command to keep him in a spot several feet away from your table. If the command alone doesn't do the trick, then you could also employ a tether to help reinforce it. Even with this method, using a reward based interactive toy at the same time can help to keep him distracted. After a while, he should get the message that he needs to give you your space while you eat. No matter how cute your dog may look, begging is not a behavior that you should ever encourage. It's important that he understands what is and isn't acceptable and that he doesn't have unlimited access to your food if he is insistent enough. Dog begging can be prevented or deterred if you exercise patience and use the right techniques to keep your dog engaged so that he isn't paying attention to your food. That way mealtime can be a relaxed, stress free time for both of you.